The speed of the sideways movement of the Chi/Swing machine is adjusted by the controller. without your effort. It assists the body in moving lymph – thus allowing blood to enter the tissue. This type of device is a great aid to those who do not or cannot exercise. If lymph does not move then our watershed stagnates and stiffness/pain result due to the presence of acid and lowered oxygen in the tissue. 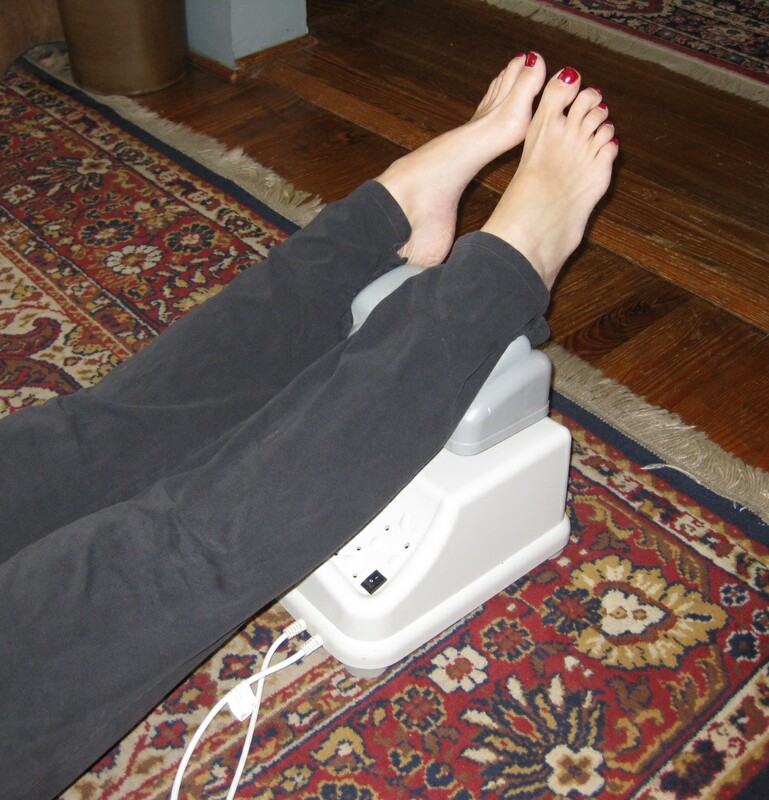 With the Chi machine, circulation improvement occurs without the negative effects of acid buildup generated by muscle contraction that occurs in regular exercise. Ankles are comfortably placed in the cradles. You lay down on the floor (w/rug preferably) on your back and place your heels onto two cradles that hold them about 6-10 inches above the floor. When the device is turned on the cradle begins swaying left and right in a movement felt all the way to the head. The gentle swinging motion creates a fish-like movement of the spine. Generally the sessions are about 10-15 minutes and are said to be equivalent of 90 minutes of walking in terms of blood oxygenation or an hour’s worth of lymphatic massage in terms of relieving lymph stagnation which also increases oxygenation. Begin at a low speed and increase gradually. Initially it is better to do 3 five-minute sessions than one long (15 minute) session. that is, turn it on and experience a gentle swaying first. Relax. This lowest setting is maybe all some people should do because of their delicate condition. Always begin at the lowest speed and shortest time setting to see how your body will respond to lymph movement. Please do not use the highest speeds at first – slower ones are more relaxing and therapeutic. Some have a timer that will automatically cut off after 15 minutes. As with any new program, discipline yourself to notice any adverse reactions along the lines of one of your detoxification systems becoming overloaded (liver/kidneys causing flu-like symptoms). Rest a few days then re-engage. Consider doing the Gentle Liver Cleanse as any stagnant lymph will go to the liver. 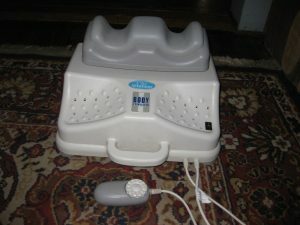 The kinds of conditions that the Chi Machine has helped seem to be in the category of impaired movement (with or without pain involvement), including paralysis. This benefit seems to be from getting blood to the non-moving parts. Another indicator that this device would be helpful is any ‘poor circulation’ indicators such as blueness in the whites of the eyes, fingernails or lips. Many report improved circulation in the lower body along with less stiffness and pain and improved flexibility. Others report weight loss from the lymph leaving their legs. The main cautions in using this device is for those on blood thinners or who have blood vessel fragility. If you are an easy bruiser take a course of VariGone (#999-9) and Bilberry (#74-8) to fortify your vasculars. The STORE tab shows how to order what I recommend. You can share this with friends too. I have learned more from very sick people than I have from double-blind, placebo-controlled, cross-over studies. My sick clients taught me how to get them well - things that even my teachers didn't know. I have such smart clients. ► Uh oh, what was I supposed to do when I think I’m getting sick? B=Breakfast, L=Lunch, D=Dinner, b=bedtime. Make sure to read What to Expect on an Herbal Program (in the Herb menu) before beginning. Dosages given are about what my clients benefit from. You may be different. Begin slowly and see how each recommendation benefits you. This website is a work in progress and a sharing tool. Feel free to use the comment forms to share your tried and true 'something natural'. This website is a work in progress and a sharing tool. Feel free to use the comment forms share your tried and true remedies. All contact info is given under the Client Info tab at the top of this page. Important info to be read BEFORE contacting us is found under Consultation Policies and THE Must Read.